We decided to take the path by the river, rather than going into the village right away. It’s a really lovely walk. 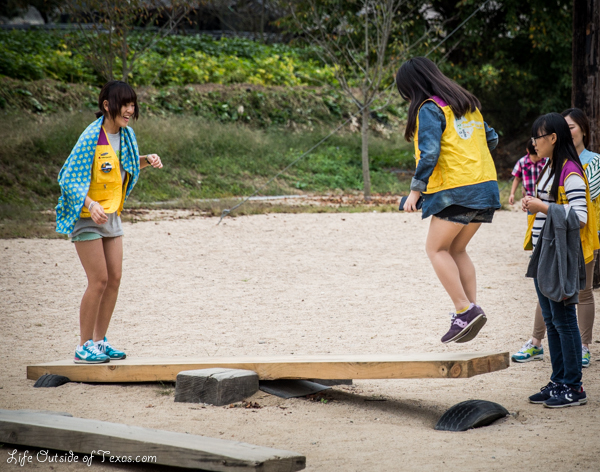 On the way to the mask dance stage we passed by a recreational area with games and huge swings. It looked like lots of fun! 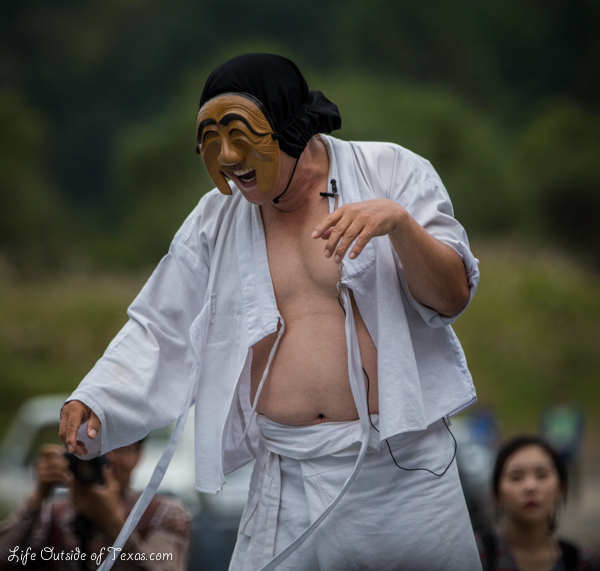 We got to the stage just in time for the 2:00pm mask dance. There was a big crowd already waiting for the show to start. We had to sit on the ground so it was difficult to take photos over the heads of those in front of us. 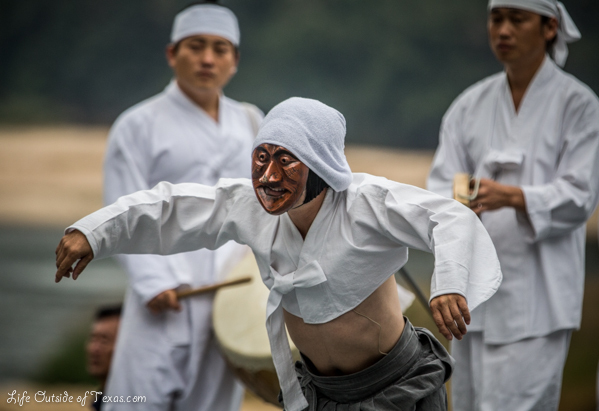 The performance was interesting, but it was all in Korean so you couldn’t tell exactly what was going on. The part we understood best was when a bull came on stage and started peeing on the audience. Then the masked man came out with a knife and a large hammer. It was bad news for the bull. He masked man killed him with the hammer and then cut out his heart…. The show ran for a full hour and featured several interesting characters. There was a taekwondo show immediately after the mask dance show. These kids were pretty impressive! After the show we walked around the village. We hadn’t eaten since breakfast so we had to make another really difficult decision: stay for the fireworks show or leave and have dinner. We chose to leave. 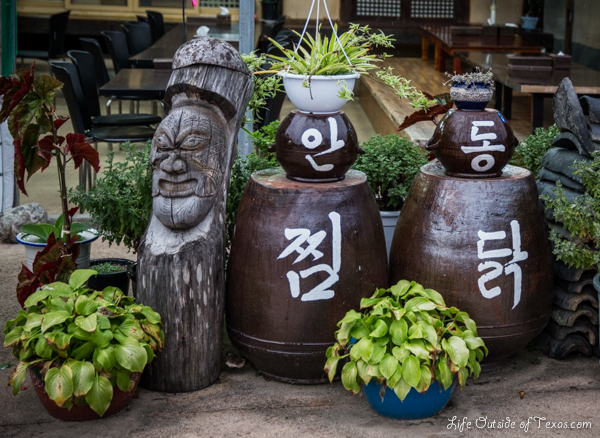 There are places to buy food in the village, but I really wanted to try jjimdak while we were in Andong. We ended up taking the shuttle back and eating at the restaurant across the street. We had two of Andong’s famous dishes: Andong style jjimdak and Andong style bibimbap. We sat outside and the weather was perfect and the food was delicious! We heard that accommodation in Andong was difficult to find so we opted to stay in Daegu instead (about halfway between Andong and Ulsan). You could probably find a love motel to stay at, but we prefer to have something booked ahead of time. It’s definitely close enough (to Ulsan) to drive back, but we enjoyed the break. By car: You can plug Hahoe into your navigation system and it should list the village. 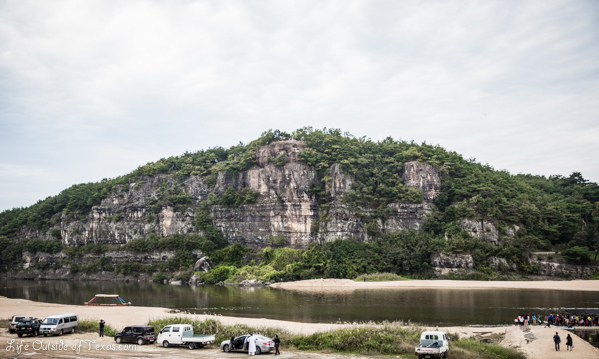 From Ulsan, the drive took us about 3 1/2 hours. 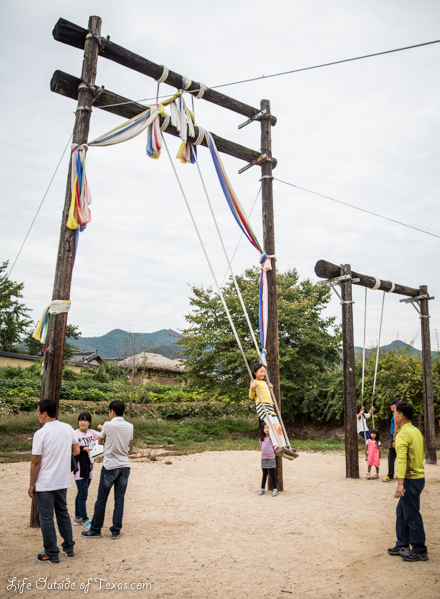 We paid 2,000 won to park at the Hahoe Folk Village and about 10,000 in tolls each way. By train: The Mungunghwa trains run to Andong. Check out the Korail site for timetables. 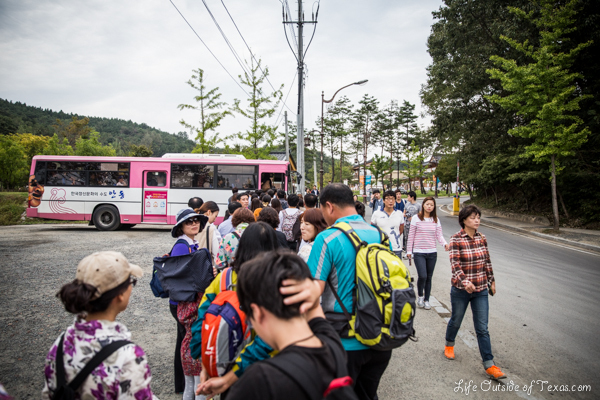 By bus: Bus times to Andong vary by city, but I found a really helpful resource with timetables of buses leaving Andong (click here). 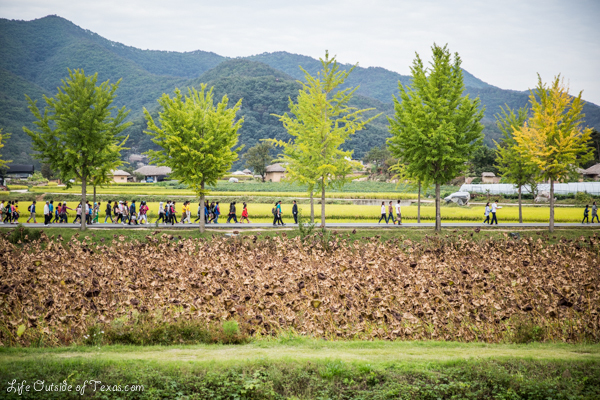 If you’re going to the main festival, it will take about 15 minutes by taxi (from the bus terminal). 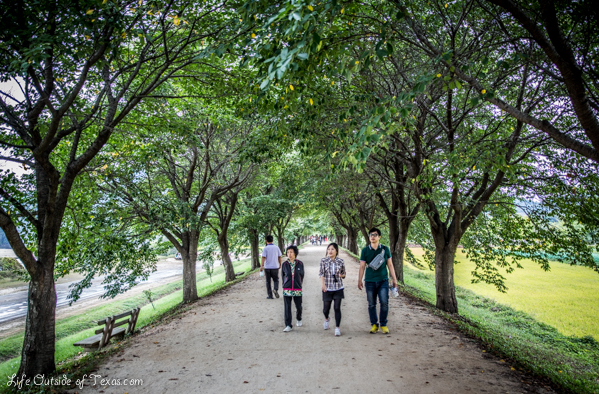 Ask your driver to take you to Tal-choom-goeng-won (탈춤공원). 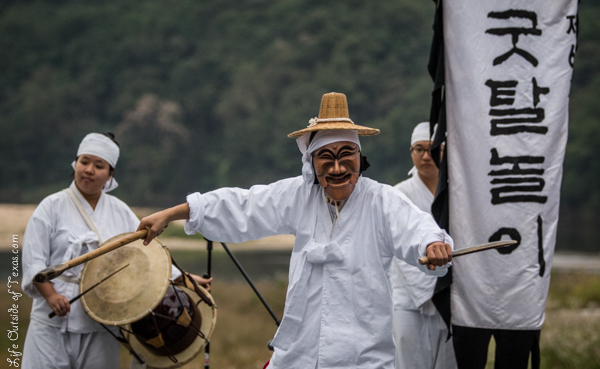 To get to the Hahoe Folk Village, you can take bus number 46. The stop is across from Andong Intercity Bus Terminal. Get off at Hahoe Ma-eul (하회마을). 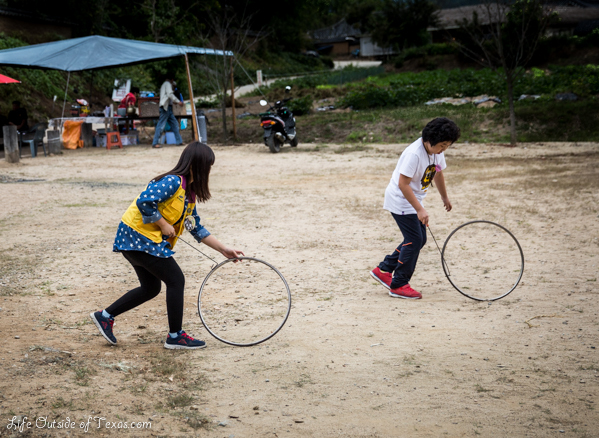 Admission to the main festival is 7,000 per person or 3,000 for the Hahoe Folk Village (prices are lower for children). 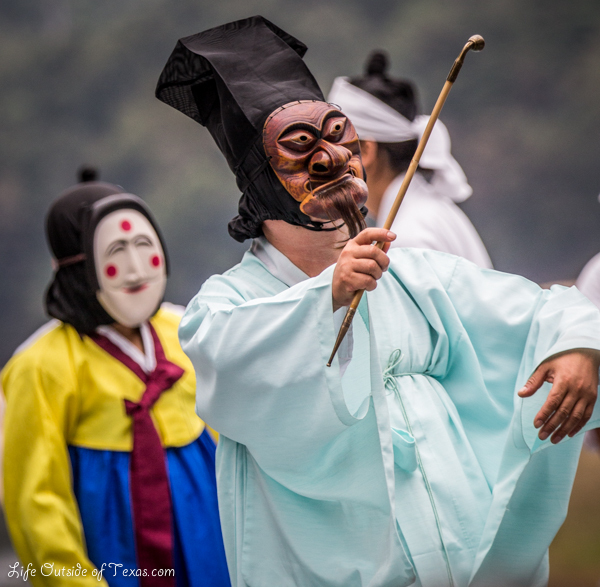 This entry was posted in Festivals in Korea, Gyeongsangbuk-do and tagged Andong bibimbap, Andong jjimdak, Andong Mask Festival, festivals in Korea, Hahoe Folk Village, hanok village Korea, 안동국제탈춤페스티벌, 하회마을, Korean culture, October in Korea, things to do in Andong, things to do in Korea, Ulsan travel, Ulsan trip ideas, UNESCO World Heritage Korea by Meagan & Dave | HappilyEverExpat.com. Bookmark the permalink. Thanks… This is a really great festival. The mask dance is really interesting. 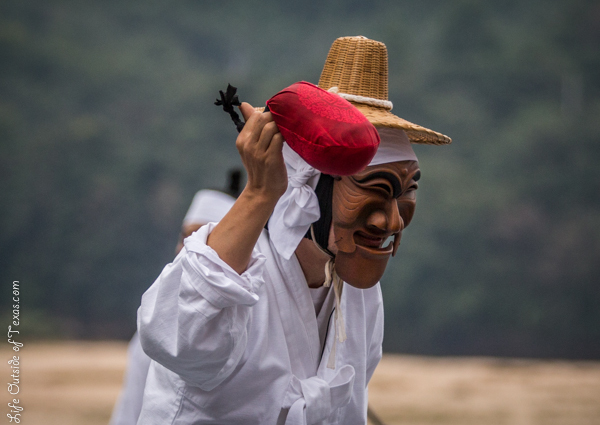 The first mask looks like an Asian version of the V for Vendetta mask. Kind of creepy! Did you ever find out what the “purpose” of the festival was? I wonder why they chose that story to portray. Lovely photos. 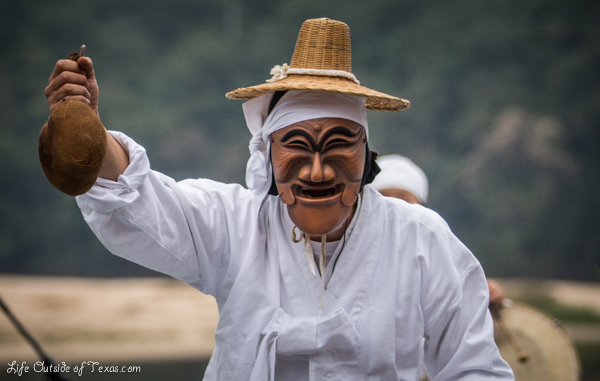 I’ve always wanted to go to the mask festival but now I don’t know if I want to go because I can’t think of anything worse than sitting through an hour long play in Korean. I think I would get SO bored! Where you able to make a mask yourself? I have read that there are mask making activities. 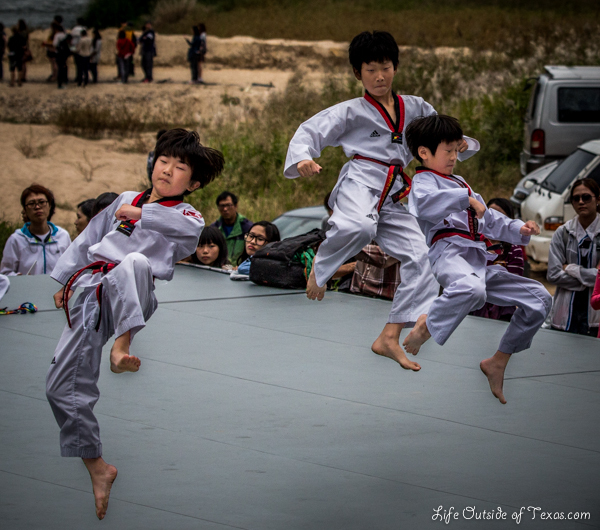 Great pictures, as usual 🙂 I particularly liked the one of the kids performing taekwondo… good action shot! I’m often tempted to do more cultural stuff, but watching a play in Korean might be difficult. At least there was some humor though and you got some good food! 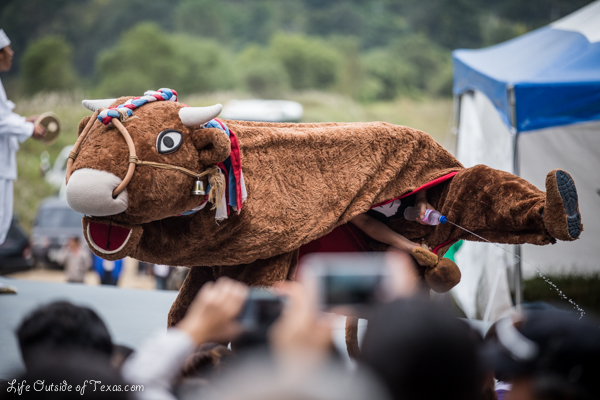 I’m heading to the beef festival in seoraksan this weekend, so we’ll see how that goes. I was in Seoul pretty much going which ever way the wind blew me. I had just bought some fruit from a street vendor and noticed the park across the street and decided to check it out. I sat for awhile and then took a walk around the park. I noticed a woman and a little girl, who I assumed was her daughter, fumbling with some droopy sunflowers. I inched closer and closer desperately trying to see what they were doing. She looked over at me and smiled and then handed my sunflower seeds, she and the little girl were eating. I smiled in amazement. I’ve had sunflower seeds before, of course. It’s just never been this fresh. That was an amazing moment for me. I stood there even after the two left. A few elderly women were tending the garden and one came over, she said, “macheesoyo?” I smiled and nodded. That “mopey sunflower” took me there. The masks are so interesting. Great photos! It’s so funny how an image can trigger a memory you’d forgotten all about. Thanks for sharing that with me. That looks like so much fun. You’re so good at finding out about festivals, I need to be better about getting out to see some of them. We plan a lot of our trips around festivals. 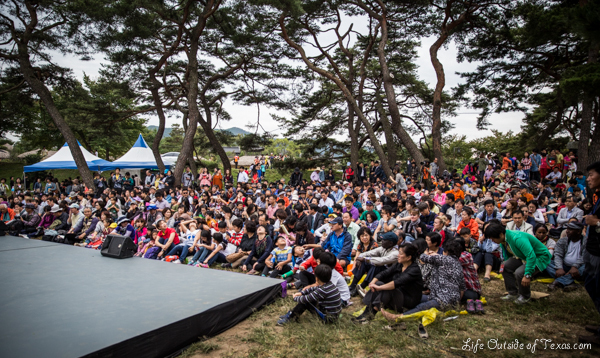 I love how there’s a festival almost every single weekend in Korea… and some of them are really good! 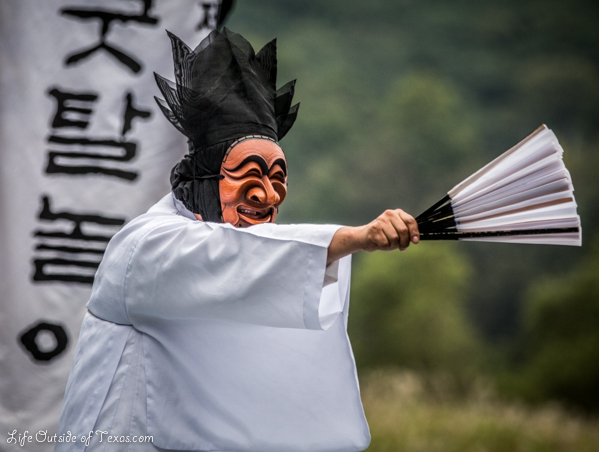 The area around Andong is really beautiful so this festival was one of our favorites. We were able to see a lot of really cool stuff in just one trip. Oh my gosh! They cut off his… testicles!? 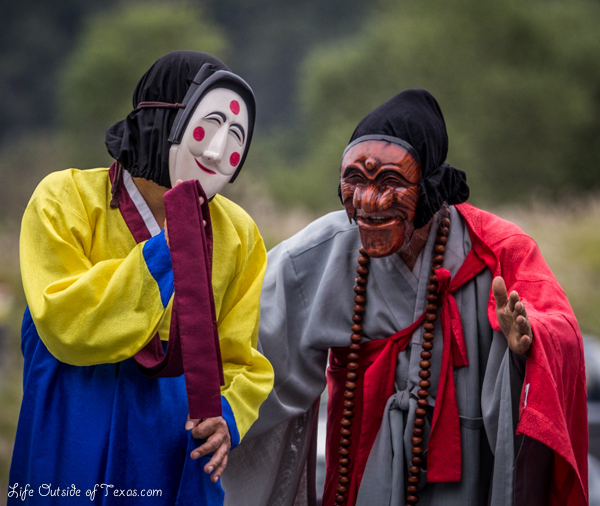 haha I guess I wouldn’t expect anything less from a Korean mask festival. This looks amazing, though. I’m on Nathan’s side with the Taekwondo picture – great job keeping the camera so still! I have trouble with that. Thanks! The key for freezing action is a really high shutter speed, otherwise things get too blurry. We shot this with a 70-200mm lens, which is REALLY heavy so I let Dave (my boyfriend) do most of the camerawork that day. The show was pretty interesting, but it was definitely a sad day for the bull. I think we bought some, but it’s in a fancy bottle so we still haven’t tried it. The jjimdak was good, but not sure I could tell a difference between the one in Andong and the others I’ve tried.